Hans Christian Andersen in “The Flying Trunk”. 1000th year of the city Odense. Although aerogrammes are not in production any more, they are still valid for use if you pay the additional postage to the current rate. The 380 øre rate was valid until 11 January 1988. 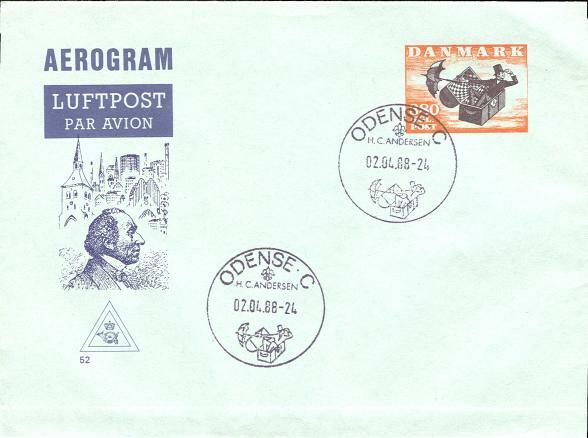 The aerogrammes had a design similar to the one above, however they were blank, that is without the Andersen portrait and the Odense background on the left. Ringstrom, S. Danmarks, Slesvigs, Dansk Vesindiens, Islands Helsager Ganzsachen Postal Stationery (Denmark, DWI, Iceland), 1985.